In multiplication of decimal numbers we will learn how to find the product of a decimal and a whole number. 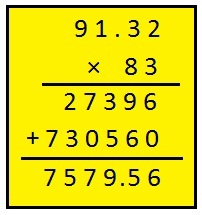 (i) Take the two numbers as whole numbers (remove the decimal) and multiply. (ii) In the product, place the decimal point after leaving digits equal to the total number of decimal places in both numbers. (iii) Counting decimal point must always be done from the units place of the product. Let us follow some of the examples on multiplication of a decimal fraction by a whole number. 1. Find 43.5 × 4. First we will perform the multiplication ignoring decimal point. Now place the decimal point in the product to get as many decimal places in the product as there are in the multiplicant. And, here the multiplicant contains one decimal place, so the product must contain one decimal place. 2. Find 91.32 × 83. Here the multiplicant contains two decimal places, so the product must contain two decimal places. First perform multiplication ignoring decimal point as we do in whole numbers. Here the multiplicant contains one decimal place, so the product must contain one decimal place.